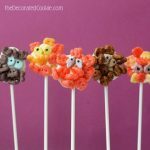 CHOCOLATE MONSTER POPS: EASY Halloween treat idea. 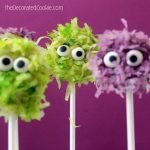 Easy chocolate monster pops are a simple Halloween party treat. 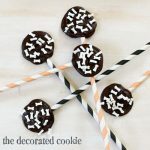 This whole piping chocolate on a stick thing is far from new on this blog. 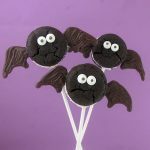 I’ve made chocolate and bones pops, chocolate spider pops, and bat wings and spider legs for Oreo Cakesters. It’s one of the easiest treats to make, aside from decorating marshmallows. 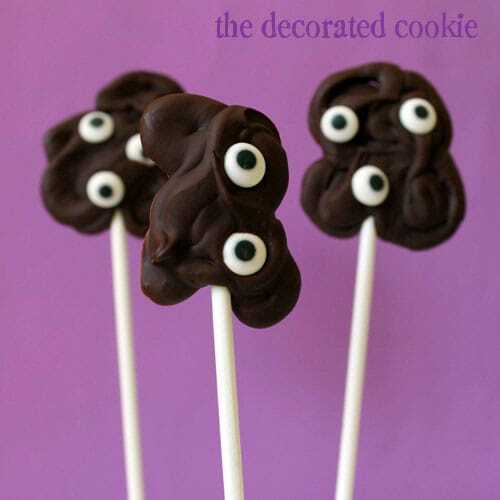 I had some leftover melted chocolate from another project (more on that soon), so I just dumped it in a decorating bag, snipped the end, grabbed some lollipop sticks and candy eyes and done and done. I have oh-so-scary chocolate monster pops. And given the blob thing, you don’t even have to be precise with the piping part. Once the chocolate cools well enough to handle, kids can easily master these. *Use any kind of chocolate you like, semi-sweet, milk, dark, vegan, whatever. Find the decorating bags, lollipop sticks and candy eyes in the craft store. Line a baking tray with wax paper and set aside. Fill a decorating bag with chocolate chips, about 1/2 full. Microwave at 70 percent power for 1 minute, then at 30 second intervals, massaging the chocolate chips periodically, until the chips are almost completely melted. Massage the chips in the bag until totally melted. Snip 1/4 inch from the tip of the decorating bag. 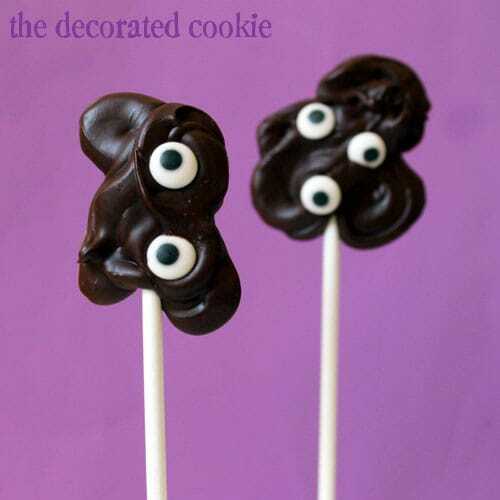 Pipe a dot on the wax paper, place the lollipop stick on the dot, then pipe a blob of chocolate on top. Add candy eyes. Once the tray is filled, refrigerate until set, an hour or two. TIP: close the bag with a rubber band after the chocolate is melted so it doesn’t ooze out the top. Michelle comment cracks me up, I am so that way too! Good to know I am not alone in my Type A mesmerizing coma! 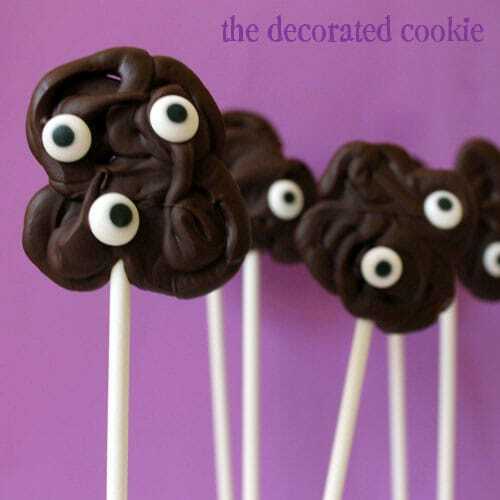 I love the blop pops, however I feel they are staring at me…….. 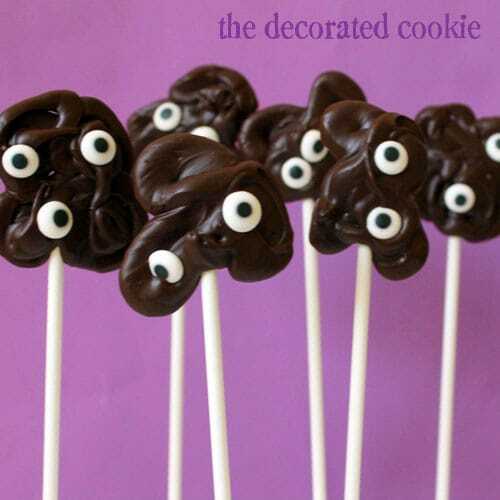 I am TOTALLY COMPLETELY 100% making these for my son’s class party at school. I heart you!